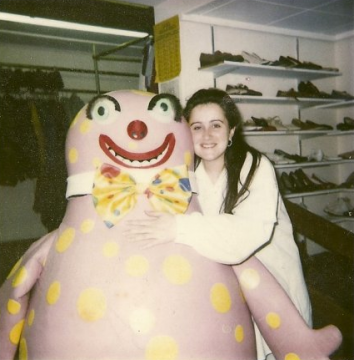 The photo shows Ruth Kiosses in the Wardrobe Department with ‘Mr Blobby’. ‘Mr Blobby’ was a character who appeared regularly in Noel Edmond’s Saturday night show: ‘Noel’s House Party’ in the early 1990s. ‘Mr Blobby’ went on to release a hit single, and was a merchandising phenomenon. I believe that ‘Mr Blobby’ was the idea of a sound man, who received very little recompense for it. Ruth remembers that Mr Blobby visited the Wardrobe Department several times, arriving in a large box from TVC. This photo was taken in old Wardrobe in the basement below Studio A. Inside was head of Wardrobe Anne-Marie Palmer(now Morrell) what a great Boss! This photograph was taken C.1991 in Old Wardrobe situated in the basement below Studio A. Mr Blobby often visited us at Pebble Mill, arriving in a large box from TVC.